Rice is the staple food in Asian countries such as China, India, Japan and Korea, but there has long been an energy "leak" in using conventional pots to cook food such as rice, porridge, meat, soup or vegetables. During preparation of such foods, the content of the pot is usually heated to boiling point and then allowed to stew or simmer on the stove for a considerably long time, using up fuel to do so. However, once boiling temperature is reached, the temperature within the pot does not actually rise beyond that, even though heating continues. Instead, the energy is wastefully used just to offset the heat lost(through evaporation, conduction, convection), in order to maintain the cooking pot at boiling point temperature. In this case, "Off Fire Reboiling Pot" came with the tide of energy conservation. The Off Fire Reboiling (OFR) Pot, so called "免火再煮锅[mian huo zai zhu guo]" in Chinese, is designed for saving energy, which is unnecessarily consumed during the cooking process simply to maintain the food at sufficiently elevated temperature. An OFR Pot consists of a thermal insulating shell which envelopes a conventional cooking pot. 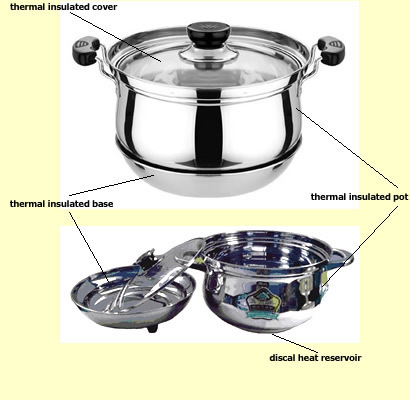 At the same time, a disc-shaped heat reservoir is installed underneath the metal base of the thermally insulated pot, which is made of a refractory material with excellent heat storage properties. When the OFR pot is placed on the hot stove, the heat reservoir begins to store heat energy. Once the food within the pot has been heated to boiling point, the heat reservoir has already stored a significant quantity of heat energy. At this point, the pot can be taken away from the stove and put on the thermally insulated base while the heat reservoir releases its stored heat energy slowly. In the first tens of minutes, the pot can be maintained at boiling point temperature, while afterwards it can be maintained above 85℃ for several hours, which is enough to ensure that the food is thoroughly cooked. OFR Pot is suited for use in countries where households are accustomed to cooking food such as rice, porridge, meat, soups and vegetables on a daily basis, i.e. Asian countries such as China, India, Japan and Korea. It is particularly suited to households which use gas stoves. Although OFR Pot was invented in as early as 1988, its commercialization was realized only in recent years. Now, no relying on government's support, there are 20-30 small and medium unorganized enterprises producing OFR Pot in China, with a total annual production of 500 000 - 800 000 OFR Pots, which are put on the market as a common commodity. Advertisements can occasionally be seen on local TV and on the Internet, although the products are still far from perfect. The price of most OFR Pots varies from 100 RMB (15 USD) to 500 RMB (75 USD), however, a more reasonable price has been found to be 250%-300% the price of conventional pot, i.e. 80-150 RMB (12-22 USD). Some manufacturers tend to profiteer by selling pots at 800-1000 RMB (120-150 USD) apiece, something thought to be a hindrance to the commercialization of OFR Pot. In 2007, the countrywide gas consumption for households in China consisted of 16 080 000 tons of LPG for 35 000 000 households; 13 300 000 000 m3 of natural gas consumption for 36 050 000 households; and 16 100 000 000 m3 of coal gas consumption for 33 950 000 households. 48 240 000 tons of CO2 emission caused by LPG burning (assuming that 1 ton of LPG generates 3 tons of CO2), 26 600 000 tons of CO2 emission caused by natural gas burning (assuming that 1m3 of natural gas generates 0.002 ton of CO2), and 16 100 000 tons of CO2 emission caused by burning coal gas (assuming that 1m3 of coal gas generates 0.001 ton of CO2). Total emissions therefore, come to 90 940 000 tons of CO2 per year. 1. A conservative estimate that the market size for OFR Pots in China is around 40% of gas consuming households (currently numbering 105 000 000). 2. These gas consuming households use half of their consumed gas on cooking rice and other types of food. 3. In the process of cooking rice and the like, use of OFR Pots can lead to savings in gas consumption of up to 40%. Let us take for example a household that uses coal gas for cooking, with an average annual consumption of coal gas at 474 m3 per household (considering consumption of 16 100 000 000 m3 for 33 950 000 households). 1. This household uses half of their consumed gas for cooking rice and other food. 2. In the process of cooking, use of the OFR Pot can lead to 40% reduction in gas consumption. The purchase cost of an OFR Pot (on average 17 USD) can therefore be returned within 1-2 years, while the product has a useful life of 8-12 years. Therefore there is an advantage to households in buying and using OFR Pots. The initial investment for a factory with an annual production of 1 500 000 OFR Pots is about 4 500 000 USD. It is assumed that the manufacturer will expect to make a profit of ≥20% of the product's selling price, i.e. a minimum of 3 USD per OFR Pot. Assuming operation at maximum capacity and minimum profit, the manufacturer's investment may be returned within 1 year. However, the actual profit would depend on the number of pots sold and considering initial promotional expenses, profit may initially be zero, or even negative. As the market for the product grows and demand increases, profit would then be expected to steadily increase. Furthermore, promotion of OFR Pots has potential to be certified as a Clean Development Mechanism (CDM) initiative, enabling manufacturers to gain Certified Emission Reduction (CERs) credits as additional income. The long-term vision for this initiative is to see 50% or more of Chinese households using OFR Pots over the next ten years, replacing conventional cooking pots. It is aimed that the OFR Pot technology will be disseminated to other countries in Asia beyond China, especially in households with similar eating habits. OFR Pot was invented in 1988, but in my patent specification some technical part wasn't disclosed, which is concerning an excellent high efficient yet inexpensive material for making OFR Pot's heat reservoir. This part of technology has been kept unpublished till now and is qualified for applying for a new patent. To buyers who would consider facilitating this project, I will consider donating a majority of the patent application rights to them, which includes half of the patent application right in China, and the patent application rights in world countries other than China and Russia. Copyright © 2017, by ZhiLiang Wan, All Rights Reserved.